Background: Imaging plays a major role in the detection, diagnosis, and ultimate treatment strategies of adnexal masses. As high as 10% of women in the United States undergo surgical evaluation for a suspected adnexal neoplasm. Objective: To understand the advantages and disadvantages of each imaging modality used in the evaluation of adnexal masses. Results: Ultrasound is frequently the imaging modality of choice for initial characterization. 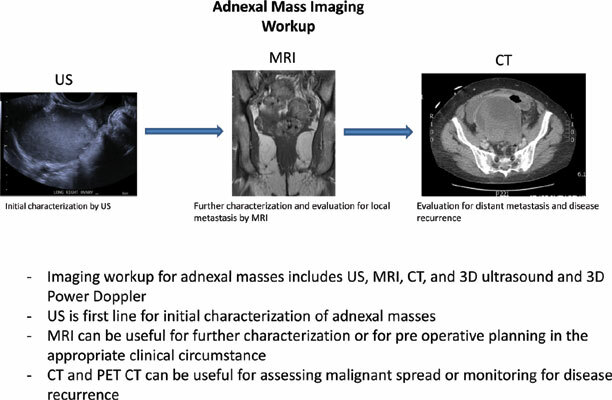 Computed tomography, magnetic resonance imaging, and positron emission tomography – computed tomography are frequently employed if malignancy is suspected to assess for metastasis. Conclusion: A basic understanding of adnexal imaging modalities will be of benefit to care providers and, in turn, be of benefit to patients. Adnexal mass, computed tomography, magnetic resonance imaging, malignancy, ovarian cancer, ovarian cysts, ultrasound.